After rumors of Mike Brown being on the hot seat, the Cavaliers General Manager Danny Ferry extended the coach a new 2-year contract extension that will keep him until 2010-11 season. 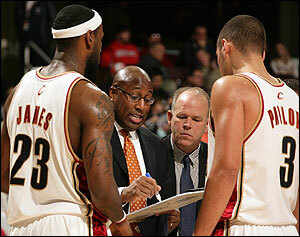 Brown is the winningest head coach in Cavaliers history with a .592 winning percentage (119-82). Brown has also won more playoff games (19) than any coach in Cavaliers history. Do you think Mike Brown deserves the new contract?